If you asked Jake Gaudet how he spends his offseason, he would probably answer like most hockey players would: skating and training. Both serve important roles in keeping the body loose and limber before reentering the demanding lifestyle of a seven-month college hockey season that includes punishing physical play and exhaustive travel. If you talked to Gaudet long enough though, you would quickly learn that hitting the weight room and getting a weekly skate in is far from the only thing that keeps the sophomore on the Massachusetts hockey team busy in the summer months. In the simplest of terms, Gaudet is describing his summer job. However, this isn’t your typical working-at-the-local-country-club gig to pass the time before heading back to school. This is a legitimate business owned and operated entirely by Gaudet himself. It works like this: customers can sign-up with a credit card through ProducetoYou.ca—a website Gaudet created—to receive weekly baskets of fresh produce delivered right to their doorstep. Every Thursday, Gaudet then goes out and picks the vegetables himself, sorts them and brings them to however many people ordered a basket that week in a little blue pickup truck he inherited from his grandfather. “Thursdays I would show up at the farm and kind of figure out what’s been picked, a lot of times it was getting stuff that’s been picked that’s not being sold so like surplus foods, then I’d pick other stuff that was fresh that could go in the basket,” Gaudet said. 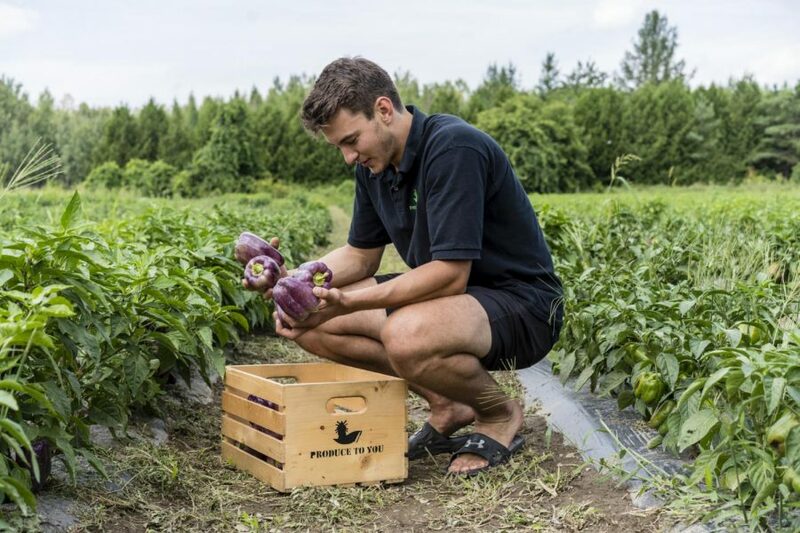 Gaudet gets his produce from Rideau Pines Farm which is located in North Gower, Ontario—about 30 minutes south from his hometown of Ottawa. It is run by John and Matt Vandenberg, who are close with Gaudet’s family. The summer after he graduated high school, he worked at Rideau Pines Farm as a “raspberry-pickings operation manager” after some motivation from his parents to find a job. “I’d drag this little wagon around and I’d go and pick up raspberries and just process them, put them in the freezer,” Gaudet said. While it wasn’t the most glamourous duty, over time, Gaudet began to fall in love with the entire farming experience. Unfortunately for him, his hockey schedule would not allow him to hold the same position the following summer, so he had to think of another way to fulfill his newfound passion. “At the end of the summer I was working at the farm and my mom was like ‘hey, here’s 40 bucks, we’re going to give a gift to our neighbor, just pick up whatever is fresh at the farm.’ So I got this nice little basket and I filled it all up and that was kind of the initial inspiration to start the business I think,” Gaudet said. With some help from the Vandenbergs, Gaudet was off and running the next summer. He experienced some bumps along the way like any new business would, whether it was accidentally miscounting pints of raspberries or going to Home Depot to try and figure out what he would use to transport the vegetables in or even how to construct a website, but Gaudet stuck with it and was rewarded for his hard work. By the end of that initial summer, Gaudet said he earned about $10,000 in sales revenue. After wrapping up his third year on the job this past summer, he’s brought in close to 50 clients purely from word-of-mouth and family friends. At his busiest, he’s making 30 deliveries a week and likes to finish by 7 p.m. every Thursday night. Profits and business acumen aside, Gaudet genuinely looks forward to his time spent at the farm. Once it reaches mid-August, Gaudet must return to Amherst to start preparing for the hockey season, thus ending his time at the farm. When he gets back, Gaudet hears some playful chirps from his Minutemen teammates about his unique offseason regimen, but he knows it’s all in good fun. “I get some flak from the guys, you know the ‘Veggie Guy, Farmer Gauds,’ but yeah no I think a lot of the guys were pretty interested, especially the freshmen in the summer,” Gaudet said. “I was only able to come for a couple days because I had to be back for Thursday to deliver, I couldn’t find anybody to do my deliveries for me. Much like his first experience picking raspberries, as time passed running a business, Gaudet developed a fascination with finance. Last spring, Gaudet joined the Minutemen Equity Fund in the Isenberg School of Management at UMass, where him and about 20 others manage a $250,000 portfolio and must determine which stocks are worth investing in. A business management major, Gaudet wanted to learn more about the field plus get some experience dealing with the stock market. Oh, and when he’s not on the ice or in the classroom, you can probably find Gaudet in a nearby river as a member of the UMass Fly Fishing Club. Admittedly small, the club offers Gaudet a chance to recharge his batteries every couple of weeks. Being active outside of hockey is nothing new for Gaudet. In high school, he played multiple different sports ranging from volleyball to track to baseball. In fact, he wasn’t even sure if hockey was in his future. “I think for me growing up I was always kind of a late bloomer. There were times in grade nine, grade 10, grade 11, I kind of debated almost not playing hockey,” Gaudet said. In levels major bantam, minor midget and major midget Gaudet said he was cut from the Triple-A team all three years—the highest level of competition in Canada. So, Gaudet played Double-A each year and it was then where he rediscovered his love for the game. Developing an identity that doesn’t pigeon-hole him into one specific category is important to Gaudet. Whether it is playing different sports, learning about the economy or starting a business from scratch, Gaudet’s interests are unlike most Division I college athletes. And at the heart of it all, doing this thing is fun for him. The vegetable thing, that is. Ryan Ames can be reached at [email protected] and on [email protected]_RyanAmes. Great article . A great motivation for young athletes, but more importantly good people . I just got through reading this and believe me I was very surprised and amazed at how good it was. It looks like you have a real knack for writing and I hope you keep it up. I look forward to reading other articles from you. Keep up the good work. I am very proud of a former Bailey kid.